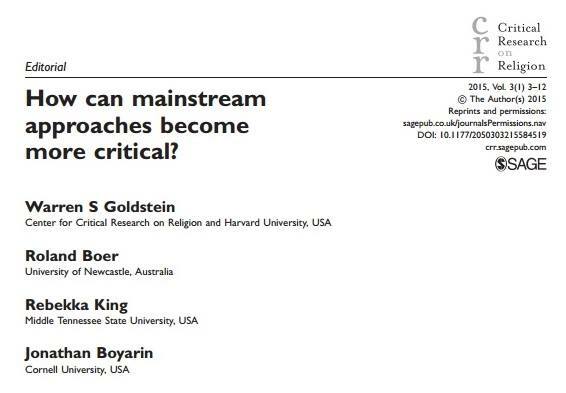 Recently Critical Research in Religion (CRR) posted an editorial titled “How Can Mainstream Approaches Become More Critical,” written by editors Warren S. Goldstein, Roland Boer, Rebekka King, and Jonathan Boyarin. The editorial identified four sites where critique could be more critical: religious studies, theology, biblical criticism, and sociology of religion. They outline strengths and weaknesses of present forms of criticism at these sites, and suggest ways we could, as scholars, push the existing boundaries. Why be more critical? They emphasize the role of scholarship in improving the human condition: “At this moment of potentially renewed energy, we believe that an increased familiarity with critical theory broadly speaking could be mobilized more fully to refine and describe the study of religion as a matter of scholarship in the service of human interest” (5). The editorial was shared widely on Facebook, and an extensive exchange took place on my own Facebook wall, largely between one of CRR’s editors, Warren S. Goldstein and Russell McCutcheon. I found the discussion interesting and revealing of a number of fault lines between different critical approaches in our field, so with the permission of those who commented, I excerpted and edited (primarily for clarity) the discussion for publication here. The contributors to the discussion include myself Craig Martin (St. Thomas Aquinas College) Matthew Baldwin (Mars Hill University), Warren S. Goldstein (Harvard University), Russell McCutcheon (University of Alabama), Per Smith, and Ian Wilson (University of Alberta). Per Smith: Russell, as a theorist do you actually reduce values to institutional norms? Or do you replace values or the explanatory power of so called “values” with something else (that’s an earnest question)? My (bad) joke about algorithms was supposed to suggest that stopping at social norms reduces explanations of human behavior to rule following. I assume you believe that something reproduces that behavior. I’m happy to agree that “values” are analytically less useful than other alternatives, but people have come to understand their own reproduction of social norms through values talk. Social institutions may actually be chief among them, working ceaselessly to ground normative behavioral expectations in “values.” The academy is no exception. I guess I see you as resisting that, but then aren’t you also resisting institutional norms around understanding behavioral expectations through so called values? There is nothing wrong with that—in fact there may be benefits to doing so—but I’m not sure it completely answers Warren’s question. What if we recast the question more generally: to what end does one resist values talk? If that end cannot itself be tied to a series of values, then how does one describe the benefits, especially within a cultural field that relies on values talk? Russell McCutcheon: When I hear an appeal to these things called values I generally find rhetorics of ahistory, transcendentalism, normativity, often wrapped up with an appeal to individual depth of being, the human condition, etc. Thus I steer well clear of that term, “value,” and, in these pithy comments, happily redescribe it as norm if by that I now get the reader’s eye on institutions, on history, on contingency, on interpellation and the co-constitution of self/group, and on the means by which what we call values are portrayed/perceived as self-evident and thus disengaged from circumstance. So a thoroughly redescribed discourse on values is what I’m aiming at here. Matthew Baldwin: I’m all for progress—especially those forms of it that Warren described above—but I think that scholarship cannot bear the weight of the demand being placed upon it by the idea that it must be “critical” in the terms being proposed in the editorial. If we assert that scholars must either pursue a (sometimes hard to discern or define or agreed upon) progressive social agenda, or be maligned as insufficiently “critical,” then we shift the grounds of the term “critical” as it is ordinarily used in most disciplines, in favor of the (historically situated) Frankfurt-school definition of Critical Theory (along the lines of Raymond Geuss’ account of it—he was a teacher of mine). It’s not entirely clear to me, in any case, that the progressive achievements described above are the result of any past scholarship at all, let alone scholarship that meets the definition of “critical” being proposed. Scholarship always plays a role in change, but only as a participant in larger matrices of discourses and action. I think the individual scholar is well served by observing institutionally agreed upon norms; more so than by deciding upon values and then acting upon them. And they’re even more well-served by critical doubt about their own positive influence on social progress. I have no doubt that one’s values influence one’s decisions about what to do with one’s time, but it is doubtful whether we can occupy these highly endowed chairs of social privilege in our own time and yet credibly claim to promote progress away from the status quo with our studies of “religion,” whatever it is that we mean by this term. Craig Martin: Warren, I’m not sure Russell and I agree completely about all of these issues, but I think we’re agreed on a central point. In my own words: I think that as scholars and teachers we must relentlessly historicize and denaturalize what presents itself as beyond history or as natural. I do have interests (my preference is to frame this in terms of interests rather than values) that drive my scholarship—e.g., I’m not a fan of patriarchy and I find that capitalism is exploitative. This might lead me to attempt to historicize or denaturalize patriarchy or capitalism. However, what I strongly attempt not to do is to thereby naturalize an alternate set of interests—e.g., I don’t want to present feminism or socialism as divine in origin, as reflecting universal truths or values, or as truly just. To say that feminism is truly just merely naturalizes a new set of social interests. Instead, I’m more likely to show how patriarchy has its own idea of justice, tied to one set of interests, and feminism has another idea of justice, tied to another set of interests, and to leave it to my readers or my students whose interests they share. That way I’m never appealing to universal truths or values, thereby violating the imperative to historicize. Instead, “truths” always turn out to be relative to various social interests, and although it’s pretty clear to my students where my interests lie, I don’t presume their interests are the same as mine and I don’t try to naturalize mine. In this way I’m most definitely political—how could denaturalizing a regnant discourse not be political?—but I don’t think I’m advancing “values” or “progress” in the way you seem to want. Consider this quote from The German Ideology: “For each new class which puts itself in the place of one ruling before it, is compelled, merely in order to carry through its aim, to represent its interest as the common interest of all the members of society.” I feel like it’s my job as a scholar to keep a spotlight on this process or movement, as opposed to engaging in the movement itself by presenting my interests as universal. And, to reflexively look back on the game I’m playing by citing Marx: of course I only cite Marx because I assume it’s a shared authority between Warren and me—by no means is Marx intrinsically or universally authoritative, although by continuing to cite him can have the effect of naturalizing his authority. Ian Wilson: Craig, although we do not want to present our interests as universal—I totally agree with you here—in the classroom environment our interests come across as authoritative in some way within our institutional contexts (whether we like it or not), right? We are the “professors,” after all. How can we then avoid promoting some kind of interests, even if unconsciously? I also imagine that you appreciate it when a student with different interests than your own changes her/his mind and adopts your interests, no? In other words, don’t you think we implicitly advocate for our interests anyways and always? Is it even possible not to? CM: Ian, absolutely, no doubt! I think that absolute transparency and reflexivity is impossible, and yes, we carry authority with the stamp of approval from the institutions that have hired us to teach. But I think that’s not a free pass to go nuts with it but rather a reason to be all the more careful. It’s an asymptotic goal, not an achievable one, in my opinion. In an attempt to be reflexive, we talk about my authority in the classroom, and I try to draw attention to how my interests might lead me to present the material one way or another. I literally ask them what motive or agenda drives how I organize my courses—thus turning the spotlight on myself in order to denaturalize my authority. I don’t know if it works, but I try. IW: I haven’t actively focused on myself and my assignments/lectures yet, though I try to point out, from time to time, the politics of the classroom/university. Perhaps I’ll try integrating an assignment/discussion that focuses on my own assignments and discussions. I’ve heard of others having students design assignments in order to point out these very things in the process. CM: Ian, it’s something that a more junior instructor or a minority might find precarious. I can question my own authority in the classroom without losing all of my authority. I imagine a woman teaching about feminism or a black man teaching about white privilege might not have the same experience. This has got me thinking that the ease with which I can denaturalize authority in the classroom might be part of my white, male privilege. Warren S. Goldstein: Russell, Craig, and Matthew: Okay, I am thinking about values in both Nietzschean and Weberian terms (naturally both of which influenced the Frankfurt School). But if we think about major historical movements, slave morality (to use Nietzsche’s term, including Judaism, Christianity, the Enlightenment, and Socialism) was based on a set of related values and the further extension of them: freedom, equality before god, political equality, economic equality. So, rather than reinvent the wheel, I would make a case that we need to go with what has been historically efficacious (while acknowledging that each of these movements has also had its regressive institutionalization). Yes, there is a tendency to universalize these values. But isn’t this what gives them their impact? Isn’t this why some of us are interested in the study of religion to begin with? I agree that there are conflicting values and conflicting interests. But finding those common threads (values) which unite the majority of a society against the self-interest of a ruling minority is the key to progressive social change. CM: Warren, I guess where we differ is that, as a scholar, I think those values you’d like to advance are another type of propaganda. As a citizen, it’s exactly the kind of propaganda I might get behind (I not using “propaganda” here in the pejorative sense), but in the classroom and as a scholar I feel like it’s my duty to try to show how it’s still another type of propaganda. Perhaps I’m too much of a relativist for your tastes? WSG: Craig, I think you need to distinguish between teaching and research. One of the best ways to teach is to present multiple positions, leave it open, and have the students grapple with it. In research, on the contrary, we make arguments. We take a mass of facts, assemble them and present them as a narrative. By the way, both your and Russell’s positions strike me as somewhat postmodern. I am not a big fan of the term propaganda. In addition, I think those who hide behind value neutrality or objectivity in reporting are not being honest. I don’t see the use of values as manipulation of the masses. Or, another way to think about it, would Martin Luther King or Gandhi (to name just two) ever have achieved anything without appealing to some common values? CM: Warren, when you say “postmodern” is that a pejorative? I don’t identify as postmodern, but I’m most definitely a post-structuralist. I think we’re agreed on those, e.g. sociologists, who hid behind value neutrality. That’s frustrating and they lack self-reflection and theoretical sophistication. As concerns Martin Luther King or Gandhi, of course they wouldn’t have achieved what they did without appealing to common values! But they weren’t scholars of religion, they were—in my opinion—successful propagandists. When I teach about historical figures like that, I focus on how they manipulated their cultural inheritances in order to construct an ideology designed achieve the social or political goals they desired. But that’s what separates me from them: they’re doing political work, while I’m analyzing how political work is done. I think what their first-order discourse is data for my second-order analysis. For instance, I teach a class on “The Evolution of Jesus,” where we look at pro-capitalist and pro-socialist Jesuses. While my political sympathies lie with the authors of the pro-socialist Jesuses, in class (or in my research) I’m inclined to analyze how they manipulate the New Testament for their particular goals. On the one end we look at things like liberation theology, on the other end we look at Bill O’Reilly’s book on Jesus. But in either case my goal is the same: to reveal how the appeals to Jesus’ authority function and how authors project their own values backward in time. RM: I’m not trying to persuade the students of anything, to be honest. In classes I’m modeling for them a certain way of talking about what people do/say, a way that is authorized by a disciplinary framework in which they have enrolled when they walk into my class; I’m initiating them into a way of talking about, redescribing if you will, the things human beings do, seeing the people we study all as historically mundane but interesting nonetheless–ourselves included, inasmuch as we’re people too. And then inviting students to consider if there is, for them, any utility in adopting and further developing this framework themselves and talking about the world in this manner—for whatever ends they may wish to pursue. PS: Russell, aren’t you trying to persuade them that thinking a certain way about these topics is worthwhile? One might also think that the approach is consciously “value neutral” or at least value free. RM: Well, I’m trying to show them what is possible to talk about if we accept these parameters, starting points, and if we therefore acknowledge these limitations. Whether they think the results are worth remembering, engaging with, or reproducing at another site is entirely up to them. I take myself to be their data more than their teacher—I am the native informant of a certain way of talking about the world, in which we start with the assumption that people do not possess transcendental knowledge and are, instead, duking it out and/or collaborating over a host of things and doing so by contingent means. They (i.e., the students) are the participant/observers. WSG: Or there is another way to go: I am teaching a lecture course at Harvard Divinity School in the fall on “Classics in the Sociology of Religion.” While providing students with all of the canon in mainstream sociology of religion, I am also engaging in a critique of it by presenting the apocrypha. I shall call the students’ attention to this from the beginning that I am putting a particular spin on the whole thing. It is not quite a balanced and neutral approach but the intention of it is to push the discipline and the students’ understanding of it beyond the boundaries. CM: Which classics and which apocrypha? WSG: It is based on one of my Method and Theory in the Study of Religion (MTSR) articles. Weber and Durkheim are accepted classics. One can also add Troeltsch and Niebuhr. But I am adding Marx, Engels, and Kautsky—particularly in relation to Weber and Troeltsch. I would also like to cover Bernstein but really don’t have enough time to assign him. As far as Durkheim, we’ll look at The Division of Labor in Society and The Elementary Forms of Religious Life; for Weber, we will look at The Protestant Ethic and the Spirit of Capitalism, Economy and Society, Sociology of Religion, and “The Economic Ethics of World Religions” (covering China, India, and Ancient Judaism); for Kautsky, Foundations of Christianity (we’ll have no time for Predecessors of Modern Socialism); for Engels, The German Peasant Wars; for Marx we’ll read the typical early texts; for Troeltsch, Social Teachings; and for Niebuhr, The Social Sources of Denominationalism. RM: Here’s a suggestion—read your MTSR article for the first class, spend the rest of the course reading all the primary sources needed to chase down your footnotes and references, and then come back to that same MTSR essay at the end. In other words, read your essay on day one and then they have to sit down and say “To understand what Goldstein is going on about who all do we have to read before we come back to his article?”—and then they make the reading list with help from you and the course is on chasing down the background to the essay. WSG: Thanks Russ! Good idea. RM: That model is then an explicit exercise in scholarship—chasing down references, reading background, etc. In lieu of a conclusion or summary of the discussion, instead I’ll take the last word by noting two things that stood out to me in this conversation. First, it appears that these competing forms of criticism or critique are working with different models of subjectivity. I suspect that for some, a somewhat liberal model of subjectivity lies behind the desire to liberate subjects from oppression; others, by contrast, seem to be deploying a post-structuralist account of subjectivity, whereby subjects are theoretically displaced by fields of discourse and power—in which case “liberation” ceases to have the same theoretical purchase. Second, I found it extremely interesting that all of those who entered this particular fray publicly present as cisgendered males. In the “Preface” to The Sacred is the Profane: The Political Nature of ‘Religion,’ Russ McCutcheon and Bill Arnal argue that “critique” in the study of religion itself needs to be historicized: “What are the conditions of possibility of the kind of critical stance toward the concept of religion that this book embodies? What is the shape of that discourse, and who participates in it” (xiii)? In addition, they find “striking … the homogeneity of those involved and most prominent in [this critical] discourse, who are typically (albeit certainly not exclusively) male, ‘Western” … and Anglophone” (xiv). I found the voices of women in our discussion conspicuous by their absence. This entry was posted in Religion and Society, Religion and Theory, Theory and Method, Uncategorized and tagged 11th Thesis on Feuerbach, biblical criticism, bill o'reilly, Capitalism, Craig Martin, cultural relativism, Emile Durkheim, Ernst Troeltsch, Facebook, Feminism, Frankfurt School, Friedrich Nietzsche, Gandhi, Ian Wilson, Jonathan Boyarin, Karl Kautsky, Liberation Theology, Martin Luther King, Marx, Matthew Baldwin, Max Weber, Per Smith, post-structuralist, postmodern, Raymond Geuss, Rebekka King, Richard Niebuhr, Roland Boer, Russell McCutcheon, Socialism, Sociology of Religion, The German Ideology, value neutrality, Warren Goldstein, William Arnal. Bookmark the permalink.